The club was founded in 1888 as Walsall Town Swifts, an amalgamation of Walsall Town F.C. and Walsall Swifts F.C. The club was one of the founder members of the Second Division in 1892, but have spent their entire existence outside English football's top division; their highest league finish was fourteenth in Division Two in 1961–62. Their first match at Wembley Stadium was the 2015 Football League Trophy Final, which they lost to Bristol City. Walsall moved into their Bescot Stadium in 1990, having previously played at nearby Fellows Park for almost a century. The team play in a red and white kit and their club crest features a swift. The club's nickname, "The Saddlers", reflects Walsall's status as a traditional centre for saddle manufacture. 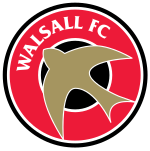 Walsall were formed as Walsall Town Swifts in 1888 when Walsall Town F.C. and Walsall Swifts F.C. amalgamated. Walsall Town had been founded in 1877 and Walsall Swifts in 1879. Both clubs had played at the Chuckery, and the new club remained at the same ground. Walsall Town Swifts' first match was a draw against Aston Villa. Two players from this early era received international caps. In 1882, Alf Jones won the first two of his three caps (against Scotland and Wales) while with Walsall Swifts, and in 1889 Albert Aldridge received the second of his two caps while playing for Walsall Town Swifts. The club were first admitted to the Football League in 1892, as founder members of the new Second Division. They moved to the West Bromwich Road ground in 1893. After finishing 14th out of 16 teams in 1894–95 the club failed to be re-elected to the Football League. At the start of the 1895 season the club moved to Hilary Street, later renamed Fellows Park. In 1896 they changed their name to Walsall F.C. and joined the Midland League. A year later, they returned to the Second Division, three teams having failed re-election in 1896. The team finished in sixth place in 1898–99, but once again failed re-election two years later, dropping back into the Midland League. A move to the Birmingham League followed in 1903, and in 1910, the club were elected to the Southern League. With the expansion of the Football League after World War I, Walsall became a founding member of the Third Division North in 1921. Walsall's highest "home" attendance was set in 1930, when they played in of front of 74,646 fans against Aston Villa in the FA Cup Fourth Round  Although a home match for Walsall, the tie was played at their opponents' Villa Park ground, and it remains the highest attendance that Walsall have ever played in front of. In 1933, Walsall won 2–0 in the FA Cup against Arsenal at Fellows Park. Arsenal went on to win the First Division that season, and the cup defeat to Third Division North side Walsall is still regarded as one of the greatest upsets in FA Cup history. In 1958, following a reorganisation of the Football League, Walsall became founder members of the Fourth Division. Under the management of Bill Moore, the club achieved successive promotions, scoring 102 goals on their way to winning Division Four in 1959–60 and finishing as Division Three runners-up in 1960–61 to reach the second tier of English football for the first time since the early 1900s. Players such as Bill 'Chopper' Guttridge, Tony Richards and Colin Taylor were intrinsically important to the success of the side. After just two seasons in the Second Division, the club were relegated back to Division Three in 1962–63, and remained there until a further demotion to the Fourth Division, in 1978–79. The club has always had a rich history of producing players who go on to play at the top level. Allan Clarke went on to win the League Championship under Don Revie at Leeds United after beginning life at Fellows Park. Bert Williams and Phil Parkes both became England goalkeepers in the years after they progressed from their roots in Walsall. David Kelly had a long career at the top level after leaving Walsall in 1988, representing the Republic of Ireland at the very highest level of international football. More recently, Michael Ricketts represented England after blossoming at Bolton Wanderers. In recent years, Matty Fryatt and Ishmel Demontagnac have both represented England age-groups. The 1980s were a period of considerable activity for Walsall. In 1983–84 they defeated First Division club Arsenal in the League Cup at Highbury, and advanced to the semi-final, where an estimated 10,000 Saddlers saw a 2–2 draw against Liverpool at Anfield, however a second leg 2–0 defeat in front of 19,591 at Fellows Park saw Walsall lose the tie 4–2 on aggregate. This cup run saw Walsall famously only 90 minutes away from playing in Europe, which was once the name of a Fanzine, unfortunately no longer running. Walsall narrowly missed out on promotion to the Second Division in the same season. In 1986 plans were announced to move Walsall to Birmingham, to groundshare with Birmingham City. The town rallied behind Barrie Blower, who led a campaign to save the club. Walsall were subsequently bought by millionaire entrepreneur and racehorse owner Terry Ramsden and with his money came high-profile signings and the attention of the national media. In 1986–87, under new manager Tommy Coakley, Walsall narrowly missed the play-offs, but made considerable progress in the FA Cup as they defeated First Division Charlton Athletic and Birmingham City and took Watford to two replays in the fifth round. Walsall earned promotion through the old Division Three play-offs in 1988, beating Bristol City in a replayed final at Fellows Park, 13,007 where there to see it. 1988–89 saw the club relegated from Division Two and Ramsden's business empire collapsed alongside the Tokyo Stock Exchange. Walsall were minutes from being taken over by Japanese administrators and folded, but survived, again through the actions of Barrie Blower and local businessmen. Further relegation followed at the end of 1989–90 as Walsall were consigned to Division Four. The club moved to the Bescot Stadium in 1990. At the time it was a state-of-the-art arena, and was only the second new Football League ground since the 1950s. The arrival at Bescot Stadium saw some stability brought back to the club after two successive relegations. Ex-Wolves star Kenny Hibbitt managed the club for four years, setting the groundwork for a golden era for the club that would follow soon after his dismissal in September 1994. New manager Chris Nicholl led the club to promotion in his first season, building the nucleus of a strong and under-rated team. Two seasons of stability followed, the team finishing 11th and 12th, before Nicholl resigned in 1997. Ex-Ajax and Danish international Jan Sorensen took the helm after Nicholl`s departure. Whilst 'The Saddlers' finished a lowly 19th in Division Two that season, the club reached the 4th Round of the League Cup, as well as rampaging through the early rounds of the FA Cup. Lincoln United were dispatched in the first round, before league newcomers Macclesfield Town were beaten 7–0 away and a victory over Peterborough United in the 3rd Round was rewarded with a glamour tie away at Manchester United, which Walsall lost 5–1. However, despite the club's cup exploits, a poor finish in the league signalled the end of Sorensen's time at Walsall after just one season. In 1998–99, ex-Aston Villa winger Ray Graydon took over as manager and led the club to a runners-up spot in Division Two, beating Man City to automatic promotion by 5 points. After an unlikely promotion to the second tier Walsall found life difficult at a higher level, but battled right until the final day of the season, when their fate was finally sealed. A 2–0 defeat at Ipswich coupled with West Brom's home victory over Charlton meant Walsall returned to the third tier, despite derby wins over local rivals Wolves, Birmingham and West Brom earlier in the campaign. The Saddlers returned to the second-tier of English Football at the first attempt, defeating Reading 3–2, after extra time, in a thrilling play-off final at Cardiff's Millennium Stadium. After a promising start to the season, the form began to slip away over the winter period. However, the signings of Fitzroy Simpson and Don Goodman added much needed steel to the side and spurred them on to reach Division One once again. Despite all the success he had delivered, it soon became clear that Ray Graydon had reached the end of the road at the club. Following an abject performance and 2–0 defeat, live on Sky Sports against local rivals West Brom, Jeff Bonser dismissed Graydon. His replacement, ex-Wolves manager Colin Lee polarised supporters, but ultimately proved to be a success. The style of football improved and Lee's signings improved the team dramatically. Relegation was avoided thanks to vital away wins against Nottingham Forest and Sheffield United. Chart of table positions of Walsall in the Football League. 2003–04 proved to be one of the most remarkable seasons in the club's history. Up until Christmas, Walsall were flying. West Bromwich Albion and Nottingham Forest were both destroyed 4–1, as new-signing, the ex-England and Arsenal star, Paul Merson, seemed to be repeating some of the magic that had led Portsmouth to promotion the previous season. Following a Boxing Day victory at Cardiff City, the club sat just four points off a place in the play-offs. However, 2004 saw a spectacular slump in form. The new year began with a disappointing FA Cup Third Round defeat away at Millwall, and an embarrassing 6–1 home defeat against fellow-strugglers Coventry City. The following weeks saw further costly defeats, and it took until 13 March for the club to win their first league game of 2004. Colin Lee was sacked on 16 April 2004 after a shambolic display at Gillingham, though the reason given for his dismissal was his decision to speak to Plymouth Argyle about their vacant manager's position. Lee was replaced on a temporary basis by Paul Merson, who was assisted by Simon Osborn. Despite the rallying cries of the ex-England international, and the backing of the town, Walsall were ultimately relegated, agonisingly by a single goal, despite a 3–2 victory over Rotherham Utd at home, on the season's final day. Despite the club's relegation and no previous managerial experience, Merson was immediately appointed as full-time manager of the club in May 2004. Although initially a popular choice, a poor season almost ended in successive relegations. However, an inspired loan signing Julian Joachim spurred the team on to winning all five of their final games of the 2004–05 season and 14th place in League One, restoring some faith in his management ability. Although the 2005–06 season started promisingly, it turned into a disastrous one for Walsall. After increasing supporter pressure following a string of bad results, culminating in a 5–0 defeat at Brentford, Merson's reign as Walsall manager came to an end on 6 February 2006. Later that month, former Birmingham City captain Kevan Broadhurst was appointed as Paul Merson's replacement. However, Walsall were relegated on 22 April 2006 after losing 3–1 to Huddersfield Town. Broadhurst was sacked the next day. On 3 May 2006, the team appointed their third permanent manager of the season in former Scunthorpe manager Richard Money. Richard Money's reign started with a bang as Walsall lost just once in the first 20 League games in League Two, including maximum points from their first seven home ties. An impressive start to the season was maintained throughout, and despite a mini-blip in February, Walsall remained in the top three for almost the entire season. Walsall were promoted into League One on 14 April after beating Notts County 2–1 away from home. On the final day of the season, Walsall drew 1–1 with Swindon Town at the County Ground thanks to a last-minute goal by Dean Keates in front of 3,419 travelling fans, to secure the League Two title. Walsall's form continued into the new season, as the club performed strongly in 2007–08, including a run of 17 League matches without defeat. However, a January transfer window that culminated in the sales of important first team players Daniel Fox and Scott Dann (both to Coventry City) caused a drop in form throughout 2008. The club's play-off challenge was ended after a run of poor results in March leading to Richard Money resigning as manager in April. Jimmy Mullen took over as caretaker manager before being given the job on a permanent basis after the club finished in 12th place. Walsall endured an inconsistent start to their League One campaign in 2008–09, with a number of home defeats leading to the sacking of manager Jimmy Mullen in January 2009. Mullen was replaced by former Walsall player Chris Hutchings. Hutchings started his reign with a 1–1 home draw with Hereford United. His first win as Walsall manager came against Leeds United on 31 January 2009 at Bescot Stadium, with Troy Deeney's first half goal proving enough in a 1–0 win. 2009–10, Hutchings's first full season as Walsall manager, was again inconsistent. At the start of December, Walsall were 7th and only a point outside the play-offs. However, the start of 2010 brought a slump in form and by the beginning of April, Walsall were 13th with only one win in seven League games. The last eight games brought a striking change in form, only losing once to seal a top 10 finish – their highest since being relegated in 2004. The end of the 2009–10 season saw some of the darkest days in the club's history. Roy Whalley stepped down at the end of that season and Jeff Bonser has not attended a Walsall game since the end of that season. The innocent supporters were eventually unbanned but no formal apology was either received or presented to either the supporters or individuals concerned. The retirement of Roy Whalley and Jeff Bonser's exile was the start of a new era at Walsall. Stefan Gamble took over the reins as Chief Executive and the club has not looked back since. The 2010–11 season started poorly and by the beginning of October, Walsall were rock-bottom of the table and facing a relegation battle. On 3 January 2011, after a 4–1 defeat against Peterborough United, Hutchings was sacked. Head of Youth, and ex-Walsall player, Dean Smith was placed in temporary charge. On 21 January he was announced as permanent manager of the club until the end of the season. On 29 January 2011, Walsall recorded their best League result since 1986 by beating Bristol Rovers 6–1. This was Smith's first win in charge, and sparked an upturn in form seeing Walsall gain ground on their relegation rivals. A 1–0 win over promotion chasing Southampton on 1 March 2011 saw Walsall climb out of the relegation zone for the first time since October. A points haul of eight in April was enough to ensure Walsall were one point clear of the drop zone going into the final set of fixtures. Despite losing 3–1 to Southampton, and accumulating only 48 points, Walsall survived relegation by one point ahead of Dagenham & Redbridge, who lost on the same day to Peterborough United. The 2011–12 season once again saw Walsall flirt with relegation from League One. However, a 1–1 draw at home to Huddersfield Town on 28 April 2012 guaranteed Walsall's survival in League One at the expense of Wycombe Wanderers, Chesterfield, Exeter City and Rochdale, who were all relegated. The 2012–13 season began with a 3–0 home defeat to Doncaster Rovers on 18 August 2012, though Walsall gradually began to improve after their initial setback, reaching 5th place in the League One table after a 2–1 win over Portsmouth at Fratton Park on 15 September 2012. However, a winless run of 16 games followed from early October until 22 December 2012, when the Saddlers defeated Colchester United 1–0 at home. Following this, the club began to prosper in the New Year, only being beaten three times in 24 games until the end of the season and emerging as a serious contender for the play-offs. Despite falling just short, they finished 9th in the table, marking a significant improvement following two seasons of struggling. On Wednesday 7 January 2015 Walsall played the Area Final first leg against Preston North End, winning 2–0 by scoring twice within the 80th to 90th minute with Tom Bradshaw playing a key part. After a stalemate second leg Walsall reach the Football League Trophy final and for the first time in their 127-year history play at Wembley Stadium where they were beaten 2–0 by Bristol City on Sunday 22 March 2015. Topping a disappointing season for the club where they managed to become clear of relegation just two games before the end of the season, a 3–3 draw with promotion play-off side, Swindon. Walsall started the 2015–16 season well, with Smith being named as League One Manager of the Month and Rico Henry named youth player of the month for August as the club ended the month at the top of the table. Walsall rejected an approach for Smith from Rotherham United in October, describing him as "fundamental to our future plans". Smith signed a new 12-month rolling contract on 16 October. However six weeks later he left Walsall for Brentford with the "Saddlers" fourth in the table; at the time of his departure he was the fourth longest serving manager in the Football League. On 18 December 2015 Walsall turned to Sean O'Driscoll as head coach. O'Driscoll, previously Liverpool manager Brendan Rodgers' assistant, had become available following Rodgers' sacking. O'Driscoll made it clear that he did not intend to make any major changes. Going into the new year Walsall were top of the table on goal difference after winning all three games since O'Driscoll took the reins. After 16 games in charge, Walsall were placed fourth but on a six-game winless run. On 6 March 2016 it was announced that Walsall had parted company with O'Driscoll. 1892 – Founder Members of the Football League Second Division. 1896 – Renamed Walsall F.C. 1896 – Move into the new Hillary Street Ground, which will later become known as Fellows Park, Walsall's home, on and off, until 1990. 1901 – Failed to gain re-election to the Football League. 1921 – League football returns to Walsall after 20 years as the club become Founder Members of the Football League Third Division North. 1933 – Beat Arsenal in the FA Cup, a result still regarded as one of the greatest FA Cup upsets of all-time. 1960 – Win the Fourth Division title. The club's first league win in their history. 1961 – Win second successive promotion to reach Second Division. 1963 – Relegated back to Third Division where the club would spend 24 out of the next 25 seasons. 1972 – Club rescued from financial oblivion by new owner Ken Wheldon. 1975 – Defeat Manchester United and Newcastle United in the FA Cup on the way to the fifth round. 1978 – Defeat Leicester City in the FA Cup on the way to the fifth round. 1979 – Sign striker Alan Buckley back from Birmingham City, for a what was a club record of £175,000 until 2016. 1984 – Reach the League Cup semi-finals, defeating Arsenal at Highbury in the fourth round. 1986 – Racecourse owner Terry Ramsden buys the club. 1988 – Promotion to the Second Division is achieved through the play-offs. 1989 – Relegation to Third Division after just one season in the Second Division. 1990 – A second successive relegation to the Fourth Division in time for the move to Bescot Stadium, a few hundred yards from Fellows Park. 1992 – Jeff Bonser buys the club, which again was minutes away from entering receivership. 1995 – Win promotion to Division Two as runners-up. 1998 – Reach the fourth round of the League Cup and FA Cup under Jan Sorensen, who lasts only one season and is succeeded by Ray Graydon. 1999 – Win promotion to Division One as runners-up ahead of Manchester City. 2000 – Relegated back to Division Two, being pipped to survival by local rivals West Bromwich Albion. 2001 – Promoted to Division One at the first attempt, winning the Division Two play-offs. 2004 – Relegated from Division One on goal difference. 2006 – Two relegations in three seasons sees the club fall to League Two. 2007 – Win the League Two title at the first attempt and are promoted back to League One. 2015 – Reach the Football League Trophy final, play at Wembley Stadium for the first time in their history but lose 2–0 to Bristol City. A 2013 survey revealed Walsall fans consider Black Country neighbours Wolverhampton Wanderers to be the club's main rivals. However, meetings between the teams are relatively rare, with Wolves having spent most of their existence in the top two tiers of English football. Only 16 competitive fixtures have been played between Walsall and Wolves, with the most recent occurring in 2014. Meetings with the Black Country's other professional cub, West Bromwich Albion, are similarly rare, with the Saddlers and the Baggies having clashed just 14 times. More regularly-contested rivalries exist with Shrewsbury Town and Port Vale. Both clubs are roughly 30 miles away from Walsall, meaning they are often the Saddlers' geographically-closest fixtures. Walsall have the upper hand in both rivalries, having won significantly more fixtures than they have lost. This multi-purpose sports ground was situated in a district near to the Walsall Arboretum. It comprised some 12 football pitches and four good-sized cricket squares. It was the first ever home ground for Walsall F.C. from 1888 until 1893. The new ground in West Bromwich Road, which had a capacity of just over 4,500, proved to be a lucky omen for The Saddlers between 1893 and 1896. Fellows Park was a former football stadium in Walsall, England. It was the home ground of Walsall F.C. from 1896 until 1990, when the team moved to the Bescot Stadium. Bescot Stadium, currently also known as Banks's Stadium for sponsorship purposes, is the home ground of Walsall Football Club. It was built in 1989–90 at a cost of £4.5m, replacing the club's previous ground, Fellows Park, which was located a quarter of a mile away. The ground was opened by Sir Stanley Matthews. For the Development and Youth Academy squads, see Walsall F.C. Youth and Reserves. For a list of former players, see Category:Walsall F.C. players. Only competitive matches are counted. Wins, losses and draws are results at the final whistle; the results of penalty shoot-outs are not counted. s Pre-WWI the Club Secretary picked the team on matchday. ^ Initially assisted by John Ward and Neil Cutler in a managerial trio. ^ a b c M Greenslade, ed. (1976). "Walsall Social Life". A History of the County of Stafford: Volume 17: Offlow hundred (part). British History Online. Retrieved 4 October 2010. ^ "Aston Villa v Walsall, 25 January 1930". 11v11.com. Retrieved 10 October 2018. ^ Porter, Steve. "Walsall 2–0 Arsenal". www.thegiantkillers.co.uk. Retrieved 5 May 2016. ^ "Up where we belong! Graydon upsets the odds to take Walsall into Division One". Birmingham Evening Mail (England). 19 May 1999. Retrieved 5 July 2008. ^ "Walsall break Reading hearts". BBC Sport. 27 May 2001. Retrieved 5 July 2008. ^ "Swindon 1–1 Walsall". BBC Sport. 5 May 2007. Retrieved 5 July 2008. ^ "Promoted Walsall's open top tour". BBC Sport. 8 May 2007. Retrieved 5 July 2008. ^ "Walsall Chief Exec fans the flames of protest - Football Supporters' Federation". www.fsf.org.uk. ^ "Dean Smith gets Walsall job until end of season". BBC Sport. 21 January 2011. Retrieved 21 January 2011. ^ "Tranmere Rovers v Walsall". 9 December 2014 – via www.bbc.co.uk. ^ "Dean Smith named Manager of the Month". Express & Star. 4 September 2015. Retrieved 27 September 2015. ^ "Dean Smith: Walsall turn down Rotherham approach for manager". BBC Sport. 7 October 2015. Retrieved 30 November 2015. ^ "'Disappointed and shocked': Fans react as Dean Smith leaves Walsall FC". Express and Star. 30 November 2015. Retrieved 30 November 2015. ^ "Sean O'Driscoll: Walsall name new head coach to replace Dean Smith". BBC. 18 December 2015. Retrieved 19 December 2015. ^ "Walsall 2–0 Peterborough". BBC. 28 December 2015. Retrieved 30 December 2015. ^ "Sean O'Driscoll: Walsall part company with head coach after 16 games". BBC. 6 March 2016. Retrieved 6 March 2016. ^ "Walsall football club: record v Port Vale". ^ "Walsall football club: record v Shrewsbury Town". ^ "Walsall rename ground Banks's Stadium". Football Shirts. 11 May 2007. Retrieved 11 May 2007. ^ "First Team". www.saddlers.co.uk. Retrieved 4 August 2018.